Apparently we don’t have to be raising our voices for our dogs to understand that we’re angry, according to a new study by cognitive scientists at the University of Veterinary Medicine, Vienna. Just by looking at our faces, dogs can tell if we’re angry, or happy. It was previously believed that dogs could only figure this out by using other senses, like hearing and smell, and by observing how we were acting. A 2013 study found that dogs can discriminate human faces in pictures. But could they also discriminate emotions? The latest study, published today in the scientific journal Current Biology, was conducted at the Clever Dog Lab at the Vetmeduni Vienna by Corsin Müller, Ludwig Huber and colleagues from the Messerli Research Institute. During a training phase, two groups of 10 dogs were shown side-by-side photos of women smiling and scowling. One group of dogs was rewarded when they nose-bonked the images of happy faces; the other group was rewarded when they touched angry faces. To ensure the dogs weren’t making their decisions based on differences between the photos, such as teeth or frown lines, the photos were split in half so dogs only saw the eye or mouth area. Even then, most of the dogs could discriminate between happy and angry face halves. They were also able to determine the emotion in photos they had not seen before. 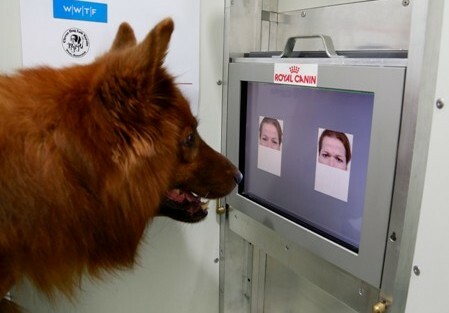 Interestingly, the dogs were able to identify happy faces much more quickly than angry faces. “It seems that dogs dislike approaching angry faces,” Huber said. The study results are surprising, since the spatial resolution of dogs’ vision is about seven times lower than that of humans. 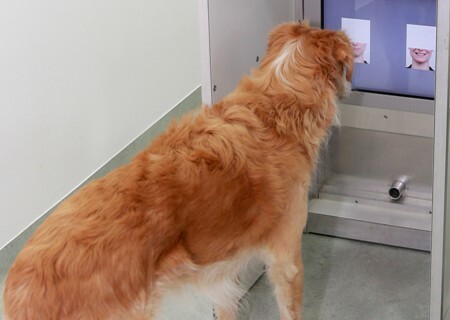 “It had been unknown that dogs could recognize human emotions in this way,” Huber said. To better understand how these visual skills are developed, the team plans to conduct similar research using wolves.